Product #45556 | SKU 2010 | 0.0 (no ratings yet) Thanks for your rating! 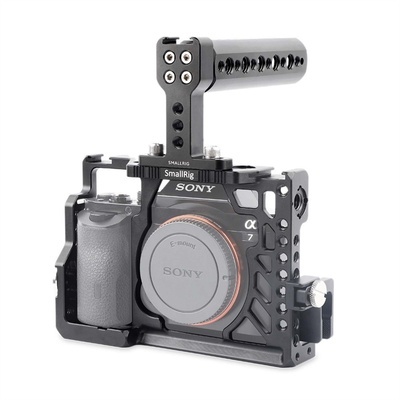 SmallRig Camera Accessory Kit for Sony A7/ A7S/ A7R 2010 is a new product made up of Sony A7 Cage 1815, universal top handle 1638, HDMI cable clamp 1822. The top handle is attached to the cage for convenient handheld shooting. HDMI cable clamp could protect HDMI cable from any damages and blocks no USB and microphone port. In addition, the cage is equipped with the cold shoes, threaded holes, ARRI locating holes and ARRI rosette etc. to connect other devices and accessories.